Try the LabCollector Data Logger Kit (1 Ethernet logger + 1 digital temperature sensor) FREE for 30 days. Temperature / Data Logger is a network based application for day-to-day control of storage equipment temperature, humidity, CO2 and other data centralized in LabCollector LIMS. Connect several kind of data logger hardware and low temperature sensors to your lab equipment and follow temperature fluctuation with the Temperature / Datalogger add-on. Our add-on can trace any type of sensors like temperature, humidity, gazes, CO2, light, pressure and switches (for alarm settings). 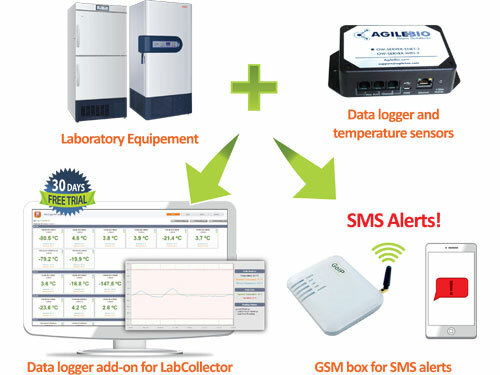 Temperature / Datalogger add-on allows lab staff to setup parameters for each equipment (expected temperature and tolerance), to define SMS receivers (using our NET/GSM logger or our SMS Gateway extension) and email alerts (through the module). All alerts are logged for historical purposes. Alert status is also managed. Finally, each user of LabCollector’s temperature logger module can easily find and retrieve information about historical equipment temperatures thanks to the graphical display. The graphs of retrieved data can be defined for various periods for quality control. Expand your data logger’s measurement and control ability! Download free trial & learn how LabCollector’s Data Logger can help you streamline the process of downloading & reviewing data. LabCollector optimizes your lab and maximizes your time for research.